Chinese furniture has a long history. The earliest piece of furniture was found in a tomb from the late Warring States period (战国时期475 to 221 BC). Back then people knelt on mats, so the furniture was low and cater to a lifestyle in which people ate, slept and worked on the ground. By the sixth century high chairs and tables appeared, and during the Song dynasty (宋朝960-1279) a multitude of furniture pieces was made for all purposes. The golden era of Chinese furniture making is the Ming dynasty (明朝1368-1644). 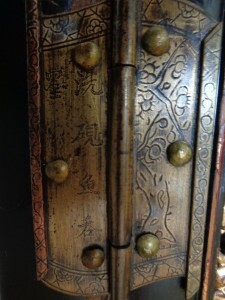 Design and craftsmanship reached new heights, and the typical Ming style is still very popular. 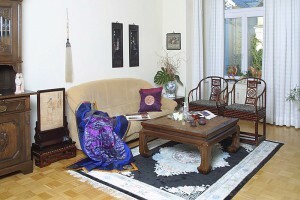 Genuine Ming furniture is very rare today. During the Qing dynasty (清朝1644-1911) a new style evolved. During the reign of the Qianlong Emperor (乾隆1736-1796) ornate carving and rich designs and decorations became popular. A piece of furniture that was very popular during the Ming dynasty was the kang table. The kang table pictured here is a low table made from elm wood; and it is more than a hundred years old. The top is tightly woven rattan in a wood frame. The bulging legs end in horse-hoof feet. Europeans often call it an opium table, but it was made for a kang(抗), a brick platform that was heated from below by hot air from nearby stoves. Kangs are especially found in northern China where the winters can be very cold. The two armchairs with horseshoe shaped armrests are made from bamboo. They were produced in the last period of the Qing dynasty. Display cabinets were popular in all dynasties, and they were widly used to showcase antiques and rare items. This small cabinet from the Qianlong period was manufactured in the Guangdong province (广东省). It is very unique and was made for a government official who collected small treasures. 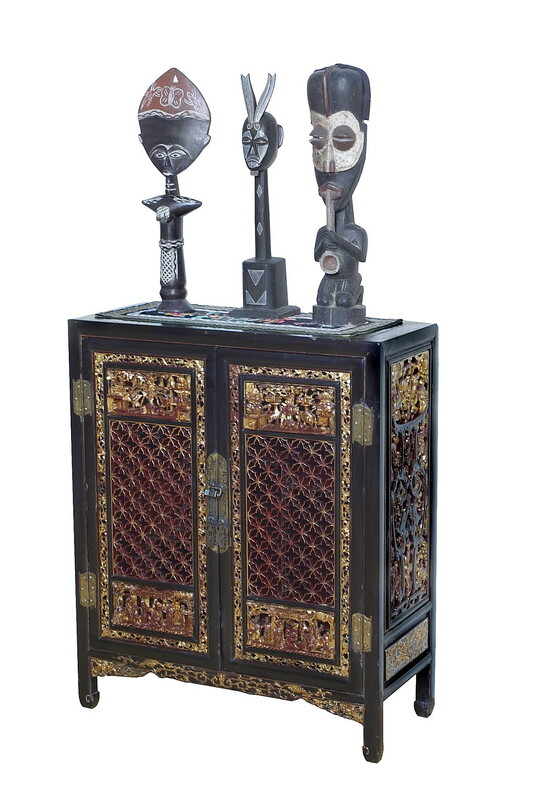 The cabinet is made from camphor wood and is lacquered in black and red with gold. The doors of open lattice work remind us of Chinese aniseed. This design was well known since the beginning of the 12th century. The doors show wonderful carved panels at the top which tell a story. 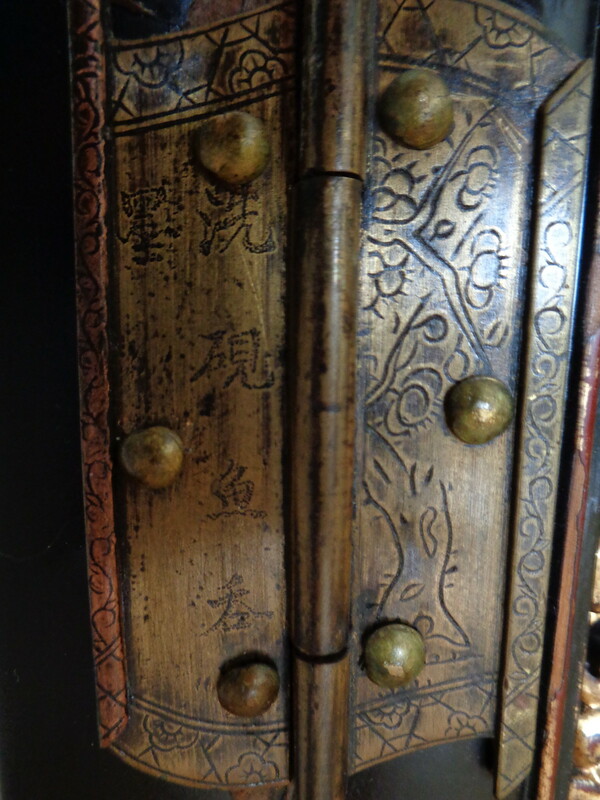 Each door hinge is decorated with a poetic verse. 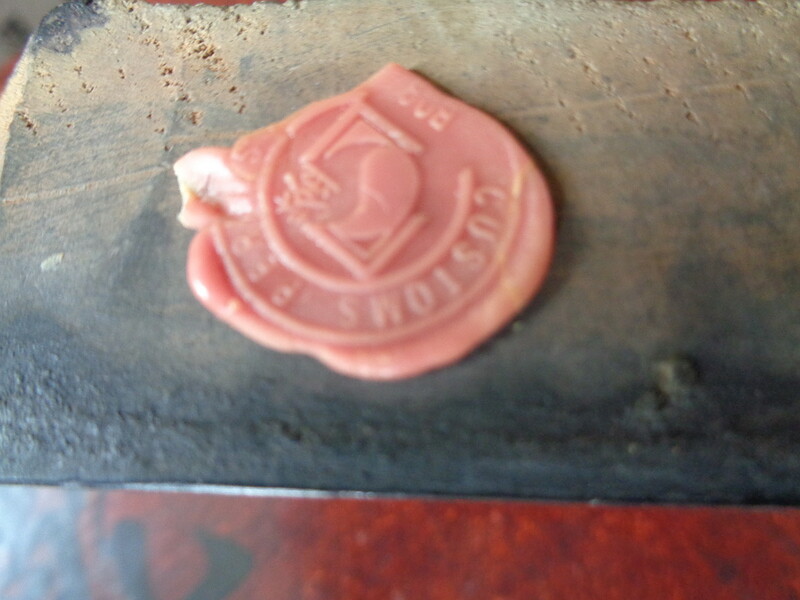 The first says: by washing the inkstone (洗砚鱼吞 墨), the fish drinks ink . The opposite of the couplet says, during boiling tea, (煎茶鹤避烟) the crane is flying away from fire. The next line tells us, that flowers and trees are prospering in spring time (花木四时春). And the last verse tells us, the ghost of the zither and the book is everlasting (琴书千古意). 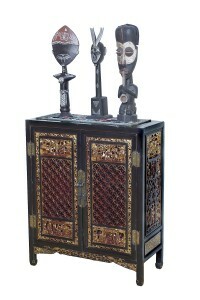 The artisan made this cabinet for a man who loved culture, literature and music. And this man probably lived in the countryside. Today, real antique furniture is becoming very rare in China. 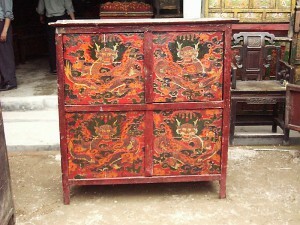 There is still some furniture from the Qing on the market, but it is hard to find genuine Ming furniture. 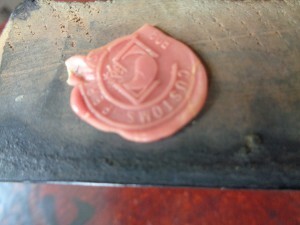 The Chinese Cultural Relics Bureau has strict rules: any item produced before 1949 is considered a “cultural relic” and cannot be taken out of the country without government permission and a red wax seal. Furniture made before 1797 is not allowed to be taken at all. All over China, especially in the south near Hongkong (香港) and Macau (澳门), the “Antique markets” are emerging. Most of the items offered there are reproductions of older pieces, for many people that is just fine. They do not care about the age and history of their item; it’s the style that matters. The true collector, on the other hand, wants original pieces and is willing to pay almost any price for them. To him, owning such a piece is a glimpse into Chinese history.